1. Remove stock timing cover. Rotate engine to top dead center of cylinder #1 so that the timing marks on the original crank and cam sprockets are directly lined up with each other, i.e. 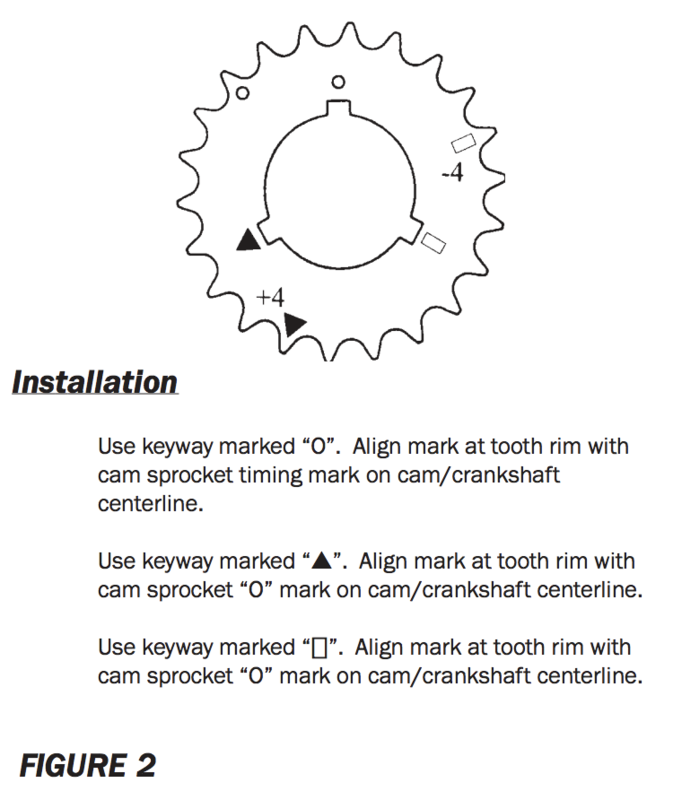 the mark on the crank sprocket will be at 12 o’clock (straight up) and the mark on the cam sprocket will be at 6 o’clock (straight down). 2. 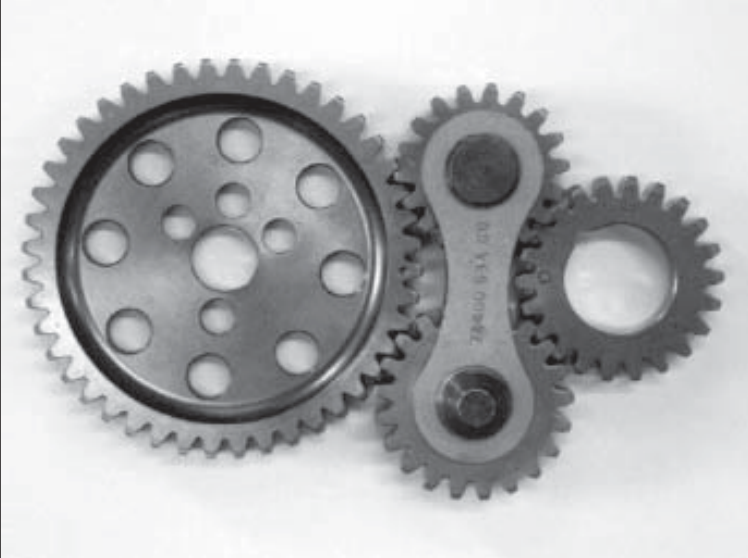 Remove sprockets and chain. 3. To insure proper clearance, replace cam thrust plate bolts with button head allen bolts included in the hardware kit. Secure bolts with Loctite. 4. Install cam gear with press fit thrust bearing included. Rotate the cam gear to make sure it moves freely and has clearance from cam thrust plate and bolts. Torque enclosed cam bolts with washers to the factory spec of 21 ft/lbs. 6. Install dog bone idler assembly as in figure 1. 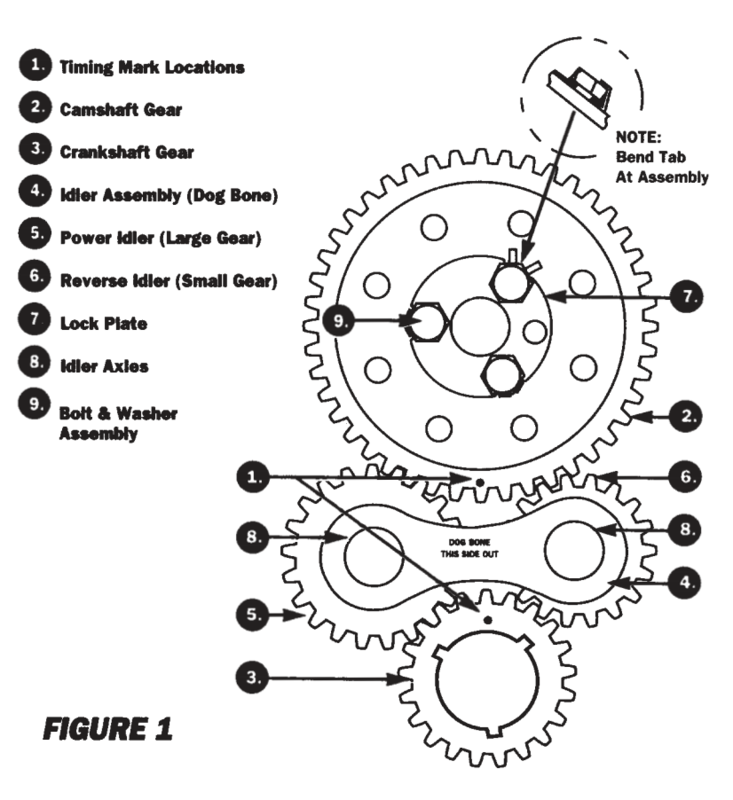 NOTE: The Jeg’s Gear Drive is made to fit under stock steel or a chrome replacement of the original timing cover. If you are using an aluminum cover, you might need to modify the bearing-to-cover endplay clearance. 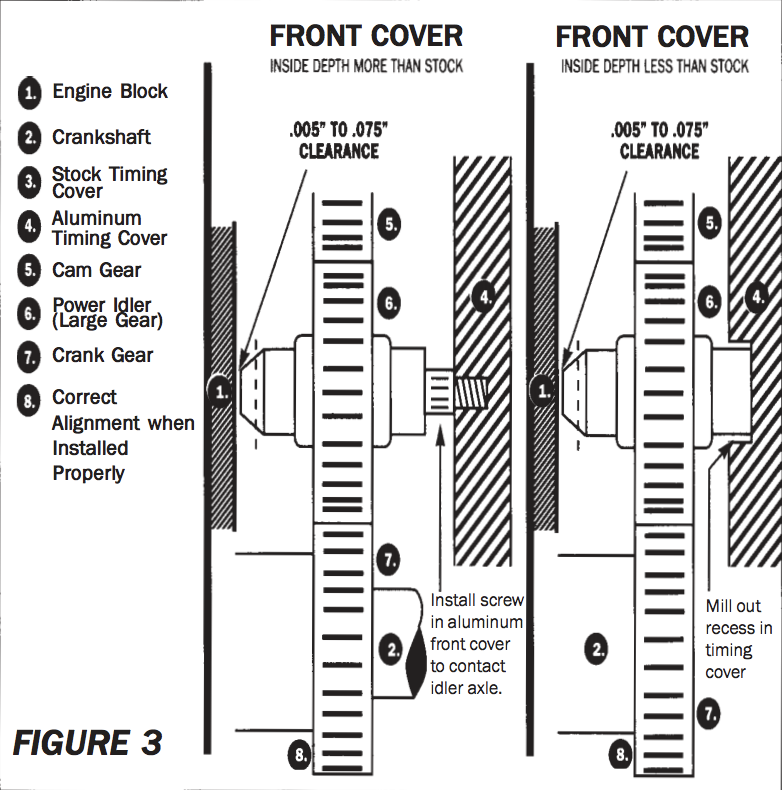 Note: In operation, idler axles are always in contact with the front cover.All engine clearance is between engine block and drive idler axles as shown in FIGURE 3. Put idler gears about half way in, then install cover (with gasket) and push into place. Remove cover and that is where idler assembly will run. The chamfered end of Power Idler axle must NOT touch block, grind of if necessary for at least .005” end clearance. Clearance putty can be used to accurately check axle/block end clearance. DO NOT TRAP AXLES between block and front cover. ALTERNATE CLEARANCE CHECK: Use clearance putty as follows: place a thin piece of putty between the block and the axle. WITHOUT USING A GASKET, hand tighten the timing cover in place, then remove to check axle/block end clearance. There should be a very thin film of clearance putty remaining on the Power Idler axle. This assures that after installation of a gasket the proper .005” to .075” clearance is maintained. Note: Must use in conjunction with Harmonic Balancer. * Always refer to the proper repair manual for the most specific and detailed instructions. DUE TO THE INTENDED USE OF PERFORMANCE APPLICATIONS, JEG’S WARRANTIES THIS PRODUCT FOR 90 DAYS FROM THE DATE OF PURCHASE. INSTALLATION OF THESE PARTS COULD AFFECT THE VEHICLE MANUFACTURERS WARRANTY COVERAGE. JEG’S IS NOT LIABLE FOR INDIRECT, INCIDENTAL, OR CONSEQUENTIAL DAMAGES IN CONNECTION WITH THE USEOF THE ITEM PURCHASED. WARNING: Not Legal For Sale on Pollution Controlled Vehicles. 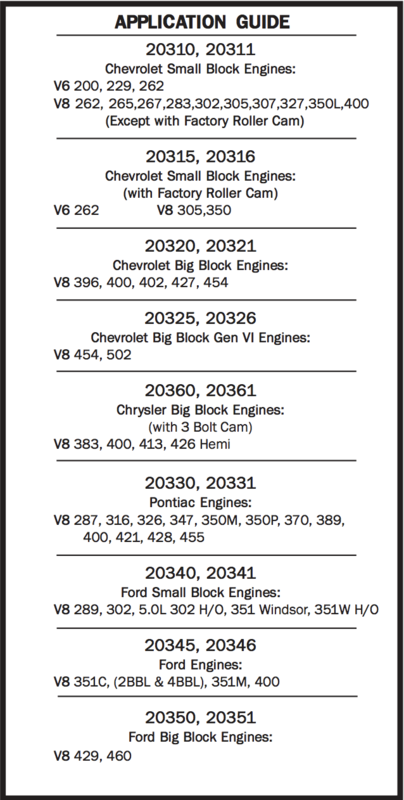 Modifications of the timing system may cause increased emissions.Refer to local, state, and federal vehicle emission regulations before installing this product. Installation of this product may be illegal under certain local, state, and federal laws.